Yorkshire's Andrew Gale celebrates his 50 against Warwickshire. YORKSHIRE captain Andrew Gale found himself at the centre of a fresh controversy when an umpiring blunder denied him his first hundred of the season. Gale, who has only just returned from a four-match ban for verbally abusing the Lancashire batsman Ashwell Prince, was caught at cover four runs short of what would have been his 18th first-class century. Gale miscued an attempted pull off a delivery from pace bowler Boyd Rankin which video replays clearly showed arrived above waist height. The laws state that “any high pitched ball (regardless of its pace) which passes or would have passed above waist height of the striker standing upright at the popping crease shall be called and signalled no ball”. Gale, who only returned to County Championship action last week following his high-profile ban, queried the decision of umpires Steve Garratt and Jeremy Lloyds. He had no sooner completed his stroke when he turned to square-leg official Lloyds and held out both arms as if to say the ball was illegal. Lloyds walked over to Garratt – ironically one of the officials when Gale was banned for the incident at Old Trafford last August – and the pair confirmed Gale’s dismissal. It ended the Yorkshire first innings at 303 in reply to Warwickshire’s 435, the visitors closing on 108-2 to take a 240-run lead into the final day. “Controversy seems to follow me around, doesn’t it?” said Gale, whose captain’s innings propelled Yorkshire past the follow-on figure of 285. “I think it was clear to see on the video footage that it wasn’t out, but these things happen so let’s move on. “I was just a bit shocked. The guy’s bowling 85mph and if that had been a Twenty20 game, there’d have been no qualms about it because the benefit always goes to the batsman. “If he’d bowled that ball another 10 times at me, I’d have probably hit it in the air because I didn’t really see it, and you can’t set yourself for a ball like that. “I was gutted to work so hard throughout the day and not get three figures, and I felt in really good touch. “It needed me to stand up and bat throughout the innings and we managed to get past the follow-on. There was nothing in Gale’s on-field actions to warrant sanction and he insisted he said nothing untoward. The 31-year-old was ordered to attend an anger management course by the England and Wales Cricket Board following the Prince incident and stressed that he had learned his lesson. Gale met Stuart Cummings, the ECB Cricket Liaison Official at the game, after play but did not elaborate on what was discussed. Gale and Jack Leaning each started the day unbeaten on 17 as Yorkshire resumed on 128-3. They had taken their stand to 97 in 26 overs when Leaning fell just after midday, caught at backward square-leg from a top-edged pull off Rankin. Yorkshire lost two wickets straight after lunch as Tim Bresnan was bowled by Jeetan Patel and James Middlebrook run out, and they slipped to 249-8 when Steve Patterson was caught behind off Rankin at the second attempt. But Gale found a willing ally in Jack Brooks, who helped him to save the follow-on before he carved to third man off Rankin. 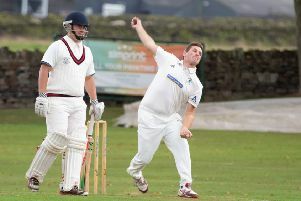 Gale’s wicket gave Rankin career-best figures of 6-55, with the Irishman admitting that the Yorkshireman’s dismissal was “touch and go”. Bresnan trapped Varun Chopra in the Warwickshire second innings and Will Porterfield was caught at cover off Middlebrook. But first-innings centurion Ian Westwood is still there on 48. “We’re behind the eight-ball,” conceded Gale. “They’re probably going to look to set us a total and we’re going to have to bat well, either to save the game or to chase them down. “If I was in their position, it’s all about what’s a good score to leave.